I had very little time to explore the two major bicycle shows I attended in September, which both good and bad. Good as I was too pressed for time in very busy booths (good for the buzz and orders), bad as I didn't get much of a chance to go out and see what other companies were showing. 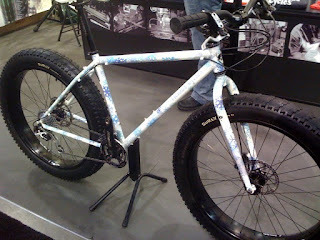 One booth that I always make a point of stopping by is the 10x20 space occupied by New Paltz, NY-based Vicious Cycles. A true craftsman who works with steel and titanium and wrapped in gorgeous paint, Carl Schlemowitz always has some tasty offerings on display. This year was no exception. Among his offerings... the Thunderwing. What is this wide-tired contraption? 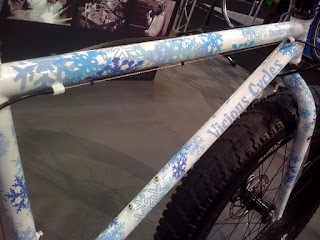 It's a winter bike. And while I have no use for a snow-oriented bike here in sunny San Diego County, I certainly appreciate the craftsmanship and finish work. And while fat-tired extreme-terrain bikes are nothing new (and likely good on the beach - hmm...), they're still fun to look at and even more fun to ride.